Gov. Doug Ducey finished the last session of his first term in office with a bang, overseeing a budget process that he threw a bomb into mid-session, all in an effort to avoid a historic teacher strike. Gov. 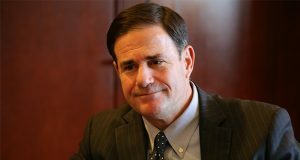 Doug Ducey made gains on several issues — most notably K-12 education funding — this session, but his plans for far-reaching water reform quickly dried up. Gov. Doug Ducey has faced difficult legislative sessions before. But this session was on another level. The closure comes after an autonomous Uber vehicle struck and killed a pedestrian in Tempe in March, and stems from an internal safety assessment the company took on following the incident. President Donald Trump dined Monday evening with Republican governors supportive of his immigration policies to discuss plans for border security and deporting people in the U.S. illegally. Motorists are going to be able to operate their cars and trucks on Arizona roads with the same level of liability insurance they had to purchase in 1972. Arizonans who don't take pretty much any job after being out of work for at least four weeks will lose their unemployment benefits. Gov. Doug Ducey could upend elections in two major Arizona cities by effectively doing nothing. Former Arizona Secretary of State Ken Bennett says lawyers representing Gov. Doug Ducey's re-election campaign threatened to sue a firm collecting signatures to qualify Bennett for the Republican primary ballot.